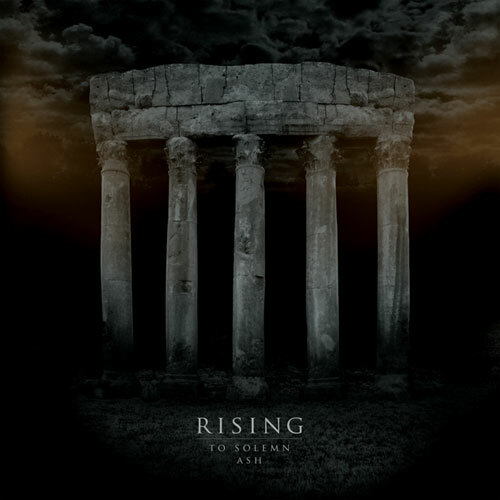 Heavy Planet : Sunday Sludge: Rising - "To Solemn Ash"
Sunday Sludge: Rising - "To Solemn Ash"
Is it safe to say we've all had our fill of Super Bowl XLVI? A perfect counter to today's endless coverage of Tom Brady's good looks and Eli Manning's dopey posturing is Sunday Sludge. Luckily, a great majority of metal fans don't have to suffer the media saturation we experience in the states. In fact, we might conclude Copenhagen's Rising have more fans in Denmark and all of Scandinavia than does the NFL. Regardless, the band's To Solemn Ash is today's best excuse to turn off televisions. Though the Danish three-piece leaves plenty of thick sludge caked under our nails, Rising's debut album contains excellent elements of thrash, doom, stoner, and even power metal. Where most sludge is driven by rhythms, To Solemn Ash's ten piercing shards are heavy on the riffs and short on disappointment. From Mausoleum's crusty door-busting entrance to the fat grind that carries home Seven Riders, listeners can hit play with the confidence they'll enjoy all of the disc's forty-seven minutes. The album's opener wastes no time in dropping doom-riffs and quickly laying a low groove. You may wonder how the band isn't from Savannah, given the sticky swamp attributes. But the buzzing tornado of guitar fuzz keeps the influences and comparisons to shallow minimums and allows Rising to establish an identity all their own. Henrik Hald's bass licks highlight Sea of Basalt, while his vocals (not unlike Ben Ward's) remain gruff and boggy. Fiery riffs and steadily-trotting drums manage to keep up with Hald's low-end on a buzzing, battered mire party. If you listen just beyond the creepy, foggy creekbed of Hunter's Crown, you can almost hear a posse assembling to deliver their own brand of southern justice. Hollow basslines echo, contributing to bouncing, thunderous rhythms shifting in and out of the shoreline's thickness. Cavernous and remote, Under Callous Wings contains some of the album's grimiest moments. The grainy grind sustains, vocals growl, and the mossy jams ride a mud-skipping mule straight into themes of isolation and abandonment. Jacob Krogholt's licks effectively carry the track upward, but listeners can still count on sweat hitting the soil with crushing repetition. The grooves and hooks of The Vault stay low and cool as the grind is kept at bay with quicksand guitar solos, varying tempos, and even some dreamy atmospherics. There's an iciness in the sound, perhaps attributable to Jacob Johansen's drumwork (cymbals, specifically). The album's bruiser, Through the Eyes of Catalysis, boasts blistered skin-thumping and immediately leaves knees and elbows rubbed raw. Rising get themselves dirty without haste, while cosmic solos are quick to coat listeners in napalm. The sludge jam Cohorts Rise is To Solemn Ash's best track, rife with chewy plod and Krogholt's best solo. Slower and more fully-realized than any other song on the album, here Rising prove they can remain effective at a tamed pace. The dual vocal is weathered but perfectly complemented with heavy, otherworldly drums. And the best chaser for incendiary solos is a jammy marriage of riffs and pestled grime. Speaking of a balance struck between chords and carrion, Seven Riders is Rising's ultimate statement of lightning licks greeting bayou mudslinging. The song breaks up the sludge roll with intermittent, spacy riffs. There's no shortage of distorted buzz, leaving us sun-baked and listless. As the track slows, adopts the true sludge tag, and tries to carry itself home, axes punctuate by stabbing the grind square in the side. Failing to cloak themselves with any one label has given Rising a safety net from genre traps. They haven't sharpened their sound too finely, though they've pared the excess to near-brilliance. To Solemn Ash is as solid a sludge record as you'll find, but Rising is willing to shed their skin and step away from their comfort zone. Any metal fan can find something to enjoy here. Thick without growing dull, sharp without being shrill. Almost sounds like a beer commercial. I am certain that Rising isn't more popular than the Super Bowl in Scandinavia. A lot of Danes, including myself, watch the Super Bowl every year. In fact Super Bowl events in Denmark are held in bigger venues than Rising concerts. Besides that a great review which makes me want to buy the album very soon. My apologies! Having never been to Denmark, perhaps I should do my homework. Apology accepted :-) and thanks!